Canada is one of the world’s most multicultural societies. Of its population of almost 33 million people, 20.6 percent are foreign-born, and more than 250 ethnic origins are represented. The current ethnic and religious diversity is expected to continue growing alongside immigration in the coming years. Multiculturalism, and the integration of newcomers and their descendants, has been part of our past, is part of our present, and will be part of our future, as Canada continues to receive more than 250,000 immigrants per year. Given that multiculturalism and diversity are central to Canada’s past, present and future, Canada’s overall success is linked to its ongoing ability to integrate newcomers and their families, ensuring social inclusion and equality of opportunity. “Getting it right” matters. Current and future policy choices should be largely based on an evidence-based analysis of the impact and outcomes from previous policy choices. This book aims to bring together the key data from a variety of sources to provide an overall portrait of the present as well as the likely impact of recent policy choices that have emphasized integration over accommodation in multiculturalism, and meaningfulness over facilitation in citizenship. The data focus of this book provides a backdrop to current and future policy debates, hopefully resulting in more informed and balanced discussion. The story-telling power of anecdotes means that these also form part of the evidence base given their impact on public debate. However, having an overall sense of what the data shows should hopefully attenuate some of the tensions and rhetoric that can emerge. On the whole, the data shows that Canada has been remarkably successful in integrating its large number of immigrants and diverse population, although not without challenges. In many ways, this success reflects a mixture of history and luck. Our history is one of early accommodation between Aboriginal Peoples and Europeans and between French and English. Moreover, unlike many other countries, geography provides a barrier to large numbers of illegal and irregular immigrants, thus reducing the risk of poisonous debates as seen in other countries. Moreover, initial advocacy of multiculturalism in the 1960s was by European and Christian groups, such as Ukrainian Canadians, who wanted their contribution to the building of Canada to be recognized alongside Aboriginal, French and British contributions. As a result, multiculturalism emerged almost organically from this mix of history and political requirement to compromise and to accommodate differences. But it was not only history and luck. Canada made a deliberate political choice in favour of integration instead of assimilation, first articulated in the fourth volume of the Bilingualism and Biculturalism Commission report on ethnic groups other than English or French. Successive Conservative and Liberal governments liberalized immigration in the 1960s, removing race-based criteria in favour of a colour-blind point system. A strong political consensus emerged over time in favour of large-scale immigration, a relatively easy and direct pathway to citizenship, and an embrace of multiculturalism as part of Canadian identity, although concerns remained about how well different groups were integrating. Partially as a result of this choice, a lively intellectual debate emerged, flourished and contributed to national discourses on multiculturalism. Canada developed some of the leading theorists of multiculturalism, producing people like Charles Taylor, Will Kymlicka and for the Quebec variant “interculturalisme,” Gérard Bouchard, as well as a lively group of authors, pundits and academics with a wide range of perspectives on whether or not multiculturalism strengthened or weakened Canadian society. Certainly compared to most other countries, Canada has been successful in creating an overall inclusive society, one that encourages participation and equality of opportunity. 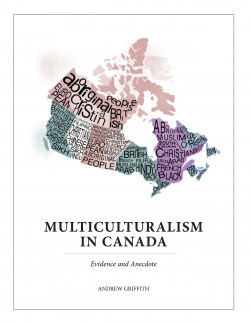 The available data from Statistics Canada, Citizenship and Immigration Canada operational statistics, employment equity figures and other sources helps us understand both the strengths and weaknesses of multiculturalism in Canada. In this book, over 200 charts and tables are used to highlight what the data and analysis show, particularly variations between groups, generations, genders and regions. In addition to covering the demographic characteristics at the national, provincial and municipal levels, this book assesses economic outcomes (for example, low-income cut-off prevalence, participation, unemployment, income and the federally regulated sectors of banking, communications and transport), social indicators (education levels, hate crimes and discrimination, healthcare and education sector workforce representation, and ethnic enclaves) and political and public sector indicators (citizenship, political party competition for the ethnic vote, judicial appointments, and public service representation). Greater and more varied diversity: Diversity within Canada continues to evolve and become more complex and varied, with over 250 ethnicities, an ever-larger visible minority population (19.1 percent) and increased religious diversity (8.8 percent). The broad visible minority and ethnic origin categories, while useful for group comparisons, understate the degree of diversity within these categories, whether in terms of religion, country of origin, time of immigration to Canada, or individual values and perspectives. And while there are commonalities across most regions, each province has its own particular “flavour” of diversity. British Columbia is more heavily Asian, Ontario has the greatest diversity, Alberta has overtaken Quebec both in numbers and diversity, and Quebec reflects the preference for French-speaking immigrants. Changing urban mix: MTV (Montreal, Toronto, Vancouver) has been replaced by TVC (Toronto, Vancouver, Calgary), and Alberta (18.4 percent visible minorities) has displaced Quebec (11.0 percent visible minorities) as Canada’s third most diverse province, reflecting Alberta’s greater economic growth. Moreover, diversity continues to expand outwards from the largest cities and their suburbs, particularly in British Columbia, Ontario and Alberta, to more medium-sized cities. Religious diversity is particularly high in the Census Metropolitan Areas of Toronto (22.2 percent), Vancouver (16.9 percent) and Calgary (12.0 percent). Historically, Quebec has been an exception to this trend, with new Canadians concentrated on the island of Montreal, but this is changing as the suburbs of Laval and Longueuil become more diverse. Economic differences persist: Economic differences persist between visible minorities and those of Canadian or European origin, whether viewed by LICO prevalence, unemployment rates, or median income, even if participation rates for visible minorities are stronger. This is also the case for most second-generation immigrants who have been schooled in Canada, although all indicators show improvement for the second generation. Median incomes of visible minorities (all generations) are 83.4 percent of non-visible minority median incomes. But second-generation visible minority median incomes are 91.0 percent compared to non-visible minorities. Moreover, second-generation university-educated visible minorities aged 25 to 34 show many groups doing as well or better than non-visible minorities, with median income of all visible minorities being 101.1 percent of non-visible minority median income. This pattern persists across the country, although visible minorities in Quebec are not doing as well. Strong educational performance: Education outcomes for most visible minority groups are significantly stronger than non-visible minority groups in terms of university diplomas (38.2 percent compared to 23.0 percent). Most groups have relatively minor differences between men and women in terms of levels of education. Canada continues to do well in integrating new Canadians in primary and secondary education. Discrimination remains an issue: Reported hate crimes and perceived discrimination remain an issue. The official statistics have been largely stable over the past four years, with Blacks being subject to relatively more hate crimes (0.28 per thousand Blacks) compared to other ethnic origins, as are Jews in comparison to other religions (0.66 per thousand Jews). Hate crimes are generally more common in provinces with greater numbers of visible minorities and religious minorities. However, these statistics do not account for other forms of religious and racial intolerance and discrimination, which account in part for the persistent differences in economic outcomes. Improved representation in public services: Representation of visible minorities in the public institutions that Canadians interact with the most — healthcare, social services and education (particularly higher education) — is relatively close to representation in the general population in the larger provinces. In healthcare, visible minorities form 26.3 percent of the workforce in British Columbia, 21.8 percent in Alberta, 24.2 percent in Ontario, and 10.4 percent in Quebec, with broadly comparable figures in social services. While many visible minorities in these sectors are in more junior positions, a number of communities have strong representation in more highly paid occupations. Visible minorities accessing healthcare are more often than not served by a mix of visible minorities and non-visible minorities. Ethnic enclaves at the riding level: While there are areas of ethnic group concentration, most ridings at the federal level have a mix of communities, some larger than others (in 2015, 33 ridings, mainly in Ontario and British Columbia, have more than 50 percent visible minorities). Typically — but not universally — visible minority MPs elected in the 2011 election tended to represent ridings with large populations of their minority group. Declining naturalization: The Canadian model of immigration leading to citizenship is at risk given declining naturalization rates, reflecting policy and program changes that have made citizenship “harder to get and easier to lose.” Changes to the citizenship study guide and test had a disproportionate effect on visible minorities, with a 14.7 percent decline in the pass rates compared to a 4.2 percent decline for European and North American ethnic origins. The 85.6 percent overall naturalization rate of all immigrants hides the more recent trend towards declines in naturalization. Political under-representation: Visible minorities and women continue to be under-represented in our federal and provincial political representatives, with the number of visible minority candidates relatively stable at 10 percent among all major parties since 2004. At the federal level, visible minorities represented 9.4 percent of all MPs elected in 2011 compared to the 15 percent of the total population who are visible minority Canadian citizens. Even the most diverse provinces, British Columbia and Ontario, have significant under-representation at both the federal and provincial levels. However, Canada has no anti-immigration party and all parties are competing for the ethnic vote. Visible minorities and women are also seriously under-represented in judicial appointments. Public sector representation reasonably strong: Core public service employment of visible minorities is roughly in line with labour market availability (LMA) for the federal government (14.1 percent compared to 15.0 percent LMA). However, some federal departments and agencies (e.g., Canadian Forces, RCMP) have significant under-representation (less than 10 percent visible minorities). The larger provincial governments also have reasonable representation, with the exception of Quebec. Settlement patterns, enclaves and social media: Will current patterns of ethnic neighbourhoods and concentration of ethnic communities continue to increase or will immigrants and their children will disperse to other communities for economic or other reasons? Will media fragmentation and social media increase silos between communities? Integration and accommodation balance: Will the dynamic between integration and accommodation continue in reasonable balance? What about the challenges posed by increased demands for religious accommodation? Discrimination remains an issue: Will implicit bias and discrimination continue to impact the economic participation and outcomes of visible minorities? More broadly, what will be the impact on civic participation and social inclusion? Radicalization and extremism: Will radicalization and extremism, both violent and non-violent, remain relatively manageable? Dual loyalties, foreign policy and diaspora politics: Will Canadians continue to find a reasonable balance between diaspora politics and loyalty to Canada and countries of origin? Will governments be able to balance coherently the range of different interests among communities with broader Canadian interests? Declining citizenship: Will “harder to get and easier to lose” citizenship continue to result in a decreasing naturalization rate and consequently a larger disenfranchised population that undermines the Canadian social fabric and our model of integration? Political representation: Will Canadian political institutions and public services become more representative of the population they serve? Multiculturalism focus: Will governments maintain a policy and program focus on longer-term multiculturalism-generational integration? Public discourse: Will media and public debate on reasonable accommodation and communities remain respectful and inclusive, while allowing for open and frank discussion?